I first heard the Britten Violin Concerto when I was twenty years old on an English seaside holiday with my family. A friend had lent me a recording, of Mark Lubotsky with Britten himself conducting, which became one of my favourite recordings of all time – I listened to it constantly and completely fell in love with the piece. Since then I’ve played it many times and never stop enjoying it, as I really believe it to be one of the greatest violin concertos of all. It is incredibly hard, one of the hardest pieces I know, but once you come to terms with the technical difficulties it is hugely rewarding to play. Such powerful music, there are moments I find as beautiful as anything I’ve ever heard. I will always remember the effect this piece had on me when I first heard it, and I don’t think that will ever go away. an early age – but he was also the composer who broke with the romantic, nationalist school that was embodied by Elgar, Parry and Vaughan Williams. Thanks to his compositions, Britten succeeded in making English music sound fresh and more modern. Shortly after leaving for the United States with his partner the tenor Peter Pears, his Concerto for Violin in D minor was premiered in New York. In Europe the threat of war grew and Britten was now convinced that he would not be able to realise his new musical ambitions in Great Britain. He dedicated his concerto to one of his teachers, Henry Boys, who had always encouraged him to delve into the most modern musical trends. A meeting with the Spanish violinist virtuoso Antonio Brosa in 1936 was the occasion for the composition of his Concerto for Violin. During the Festival of the International Society for Contemporary Music in Barcelona, they performed together his Suite for Violin and Piano, Op.6. It is probable that the particular nature of this festival and its programming (with the creation of the Violin Concerto of Alban Berg that Britten described as “overwhelming” and “sublime”), as well as the location itself (Republican Spain on the eve of the Civil War) contributed greatly to the specific character of his concerto. Benjamin Britten absolutely loved the beauty of the British coast in his native region of Suffolk. This coastal landscape would be the scene of his first large- scale opera Peter Grimes. The première of this opera in June 1945 was a huge success and became the turning point for post-war opera as well as for the composer himself. The opera is about a fisherman from Aldeburgh on the British east coast who becomes the victim of his own inability to adapt to the world around him. The rich and complex score of the opera contains six orchestral interludes from which Britten selected four: Dawn, Sunday Morning, Moonlight and Storm. With this material he created a stand-alone orchestral suite entitled Four Sea Interludes. In these interludes he describes, through a suggestive orchestration, the various moods of the sea, frequently referring to the intense emotions of the main character. 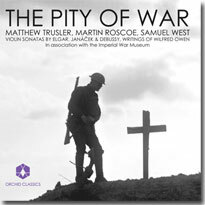 Matthew Trusler has developed a reputation as one of Britain’s leading violinists, performing with many of the world’s major orchestras, including the BBC Symphony Orchestra, Philharmonia Orchestra, London Philharmonic Orchestra, Royal Philharmonic Orchestra, City of Birmingham Symphony Orchestra, Hallé Orchestra, Academy of St. Martin-in-the-Fields, and has appeared further afield with the Minnesota Orchestra, NDR Hannover, Helsinki Philharmonic Orchestra, Deutsches Symphonie Orchester Berlin, Malaysian Philharmonic Orchestra and Johannesburg Philharmonic Orchestra. Alongside his concerto work Matthew Trusler is an accomplished recitalist and an avid chamber musician. Trusler has performed frequently with Wayne Marshall, Ashley Wass, Piotr Anderszewski, Leonidas Kavakos and Lynn Harrell. Trusler has performed recitals in leading venues around the world including the Wigmore Hall in London, the Auditorium du Louvre in Paris, and the Palais des Beaux-Arts in Brussels. Trusler founded Orchid Classics in 2005, and the label now has major distribution internationally. In addition the company recently launched a foundation to help especially talented young British musicians to make and promote recordings. Past and future artists appearing on Orchid in both spoken word and music recordings include Danny DeVito, Clive Owen, Ralph Fiennes and the Brodsky Quartet. In addition to CDs of Rosza and Korngold Violin Concertos, ‘Blues’ with Wayne Marshall and ‘Pity of War’ with Martin Roscoe, Trusler’s recording activities have seen the release of a newly orchestrated version of Heifetz’s Porgy and Bess arrangement, with the BBC Concert Orchestra conducted by Carl Davis. 2013 sees this release of Britten’s Violin Concerto as well as a new disc for children entitled ‘Fairy Tales’. Trusler also has a passion for film, and recently recorded the violin solos for the soundtrack of a new French film by director Frédéric Mermoud, ‘Complices’. Matthew Trusler holds a teaching post at the Malmo Academy in Sweden. He plays a 1711 Stradivarius. For over fifty years, the Flanders Symphony Orchestra has been a beacon of the Flemish orchestral landscape. Comprising sixty highly committed and passionate musicians, and led by renowned (guest) conductors, the Flanders Symphony Orchestra both performs and creates new compositions as well as electrifying renditions of the main symphonic repertoire from the classical period onwards. The orchestra fulfils an exemplary role in creating opportunities for young, talented musicians, composers, soloists and conductors. Thanks to its own concert series in the major venues of Flanders and Brussels, the orchestra succeeds in reaching a very large and loyal audience. In addition, the orchestra is often invited to international venues in France, Germany and The Netherlands. From the season 2013-2014 onwards the British conductor Jan Latham-Koenig will succeed the Japanese Seikyo Kim as the chief conductor of the Flanders Symphony Orchestra. Latham-Koenig is considered as one of the best conductors of the United Kingdom and has already built up extensive experience in operatic and symphonic repertoire. He is the artistic director of the Moscow Novaya Opera and the Orquesta Filarmonica de la UNAM in Mexico City. By appointing Jan Latham-Koenig as its chief conductor, the Flanders Symphony Orchestra wishes to make the symphonic repertoire, from classicism to the present, accessible to a wide and diverse audience. Each concert is a unique experience thanks to a well-balanced and bold programme. In addition, the Flanders Symphony Orchestra contributes strongly to cultural education and youth activities in Flanders using a travelling exhibition on the instruments of the orchestra. The orchestra was founded in 1960 by engineer Dirk Varendonck who was also its first conductor. From 1984 onwards the ‘Nieuw-Vlaams Symfonieorkest’ was conducted by Patrick Peire, Robert Groslot and Fabrice Bollon. The orchestra finally adopted its current name in the mid-1990s upon the arrival of the orchestra’s current manager, Dirk Coutigny. Since then the orchestra has been conducted successively by David Angus, Etienne Siebens and Seikyo Kim as their principal conductor.